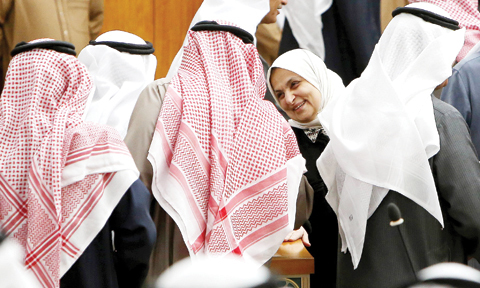 KUWAIT: Minister of Social Affairs and Labour Hind Al-Sabeeh yesterday comfortably defeated a no-confidence motion by a big margin, with 29 MPs voting in her favor and only 13 lawmakers against. Only elected MPs are allowed to vote on no-confidence motions and Cabinet ministers are barred. The vote came in a special session following a brief debate in which two MPs spoke in her defense, while two others opposed her. The no-confidence motion was filed last week by 10 MPs after a marathon grilling in which the minister was accused of committing administrative and financial violations. The minister denied the charges. MPs who supported Sabeeh yesterday said she has performed her duties in a good manner and clamped down on visa traders. Her opponents stressed that she has failed to check the influx of expatriate manpower into the country. National Assembly Speaker Marzouq Al-Ghanem said yesterday he will be travelling to Geneva with a number of MPs to meet with officials of the International Parliamentary Union to defend Kuwait against complaints by a current and a former MP and by “Zionists”. He was referring to a complaint filed by MP Shuaib Al-Muwaizri against the jailing of two lawmakers and another complaint by former Shiite MP Abdulhameed Dashti, who has been living abroad since the past two years. Dashti tweeted yesterday statements against Ghanem and vowed to continue targeting him with more complaints.